Boat is important mode of transportation on water.Nonetheless, We also use it for tourism purposes to explore beautiful places,rivers and beaches. Project, we are going to discuss today is about 2-stroke engine boats we usually see on popular tourist destinations.2-stroke engines are most common form of engines used in boats but they are far more polluting than engines used in cars.With toxic fumes they spew, they are destroying our climate gradually. Moreover, this engine emits Sulfur di oxide gas which later react with oxygen found in water to produce sulfuric acid. Sulphuric Acid is harmful for the species inside the water as well as for surroundings. 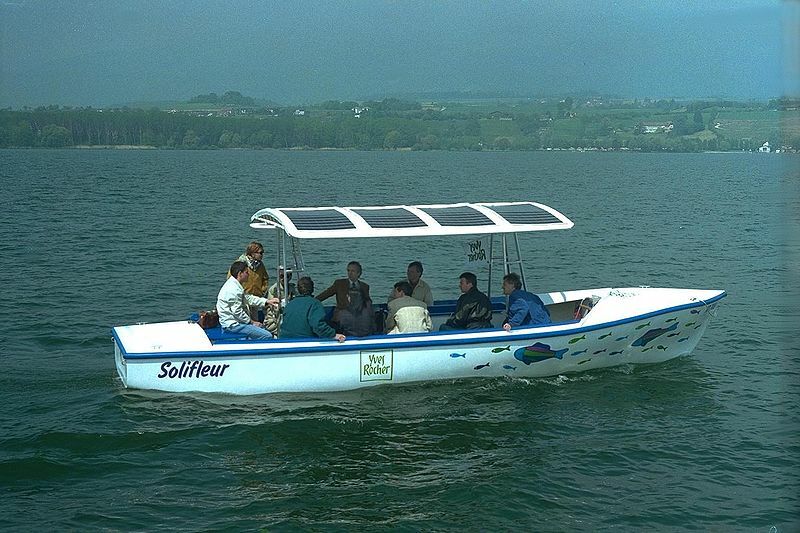 In this post, we will see, how we can use solar energy in boat to replace these traditional fuel engines.Converting these engines to electric engine helps our environment and also help us to protect our resources. Wind Power :Though, It is a good option and has been used from long time back but we have two basic problems with wind powered small boat,First it requires lot of space inside the boat and second it is not very efficient. Pedal : We can also consider using pedal boat but with pedal boat we can’t travel long distances. Hybrid(Electric + Diesel): This can be a great alternative but requires great amount of technical knowledge and processors to decide when to shift between electric to diesel and vice-versa. Electric Boat : They solve many of the above mentioned problems and that’s why we select this option, but it has problems of its own.First major problem with electric engines is their energy source itself which is electricity.Water is good conductor and we should find a ways to make sure that electricity and water get separate always. Make your boat as lighter as you can: Remove all the unnecessary mass from the boat. Powering for whole day of use: To make it attractive option, we need to power its engine with sufficient electricity for 24 x 7 travelling.To do so, we will require constant energy source which is solar energy and great energy storage unit which is our battery. To capture sunlight we requires solar cells which themselves have associated problems of weight and size. A medium size solar cell weights around 7 kg.So, if we use more solar cells, it will increase the mass which corresponds to more electricity consumption. To, somewhat solve this problem we can use tilting mechanism to capture more electricity from lesser cells..
Water proof batteries: When we travel on the water, their would be occasions when our batteries get wet, so it absolutely necessary to use water proof batteries. Efficient motor: More efficient our motor, lesser the requirement of solar cells and batteries.